Our fitness staff will assist you in creating a program that meets your individual fitness needs. So come join us in our journey to be, EverFit! Here at Cascade Living Group we strive for excellence in all aspects of retired life, which is why we offer an exercise fitness program, EverFit. Our EverFit program views physical health as a lifelong commitment to everlasting fitness – hence the name EverFit. For some individuals fitness has always been a part of their lives. 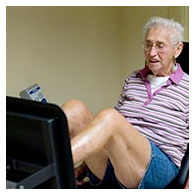 For others, fitness becomes important as they deal with the stresses of their aging bodies. 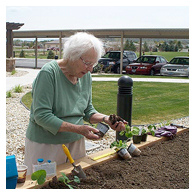 The goal of our EverFit Program is to help seniors embrace the active lifestyle and in doing so we improve and strengthen their heart, body and balance. Fitness can be anything from working in your garden to walking a mile each morning, as long as you are moving. 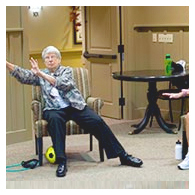 EverFit has fitness programs for our independent, assisted and memory care residents. Our program includes strength and balance classes, low impact cardio classes in our exercise studios, weight lifting equipment designed specifically for seniors, water aerobics, tai-chi, walking groups and so much more. Our EverFit Program also strives to develop intellectual fitness, as we believe fitness of the mind is equally important in developing wellness. Our brain fitness program will challenge your intellect in a fun and entertaining way. The EverFit Club has multiple opportunities to make it easy for our residents to maintain an active lifestyle, no matter what their fitness preference. And, of course, no fitness program is complete without a state-of-the-art fitness center, offering the latest equipment to meet all residents’ rehabilitation and fitness needs. Our fitness staff will take the time to work with our residents one-on-one to train them on how to appropriately and safely use every piece of equipment. Personal trainers are also available to help residents develop a workout regimen that is specific to their needs and abilities. Regardless of a resident’s current fitness level, The EverFit Club will help him or her to both establish and meet fitness goals, and hopefully lead a happier and healthier lifestyle!